EDIT: Wooah, so this thread got a lot of attention over the years! Hopefully it was a good starting point for those that figured out how to fix the issues. To this day I have not bought another Seagate drive, not really due to this issue but I generally find WD and Samsung drives are slightly better value and I have not had one die on me yet which is a start! Well guys I know MSFN will not take this thread down like Seagate so kindly did on their own forums so here goes. This thread was created by a user on the Seagate forums and the first post read like this: Good day. I've been using Seagate hard drives for 8 years.And that's why when, being in Beijing (Olympycs'08) and feeling a lack of space for photos, i've purchased a ST3500320AS. It was working ok as a reserve-hdd for 2.5 months, when, suddenly, did not appear in the morning after the PC started... The problem is: -the motor is started (the power is ok) -not detected by bios -not detected by winxp -after winxp boot from an other drive - the PC is very slow for 5-7 minutes (maybe detecting the drive) - and then works fine - the hdd is not detected by any win' programm Searching the internet i've found that: -it should be (probably) the firmware problem called "CC" (SA-problem - LED:000000CC FAddr:0024A051) -about 20-30% of 7200.11 have such problems(not detecting or "0gb space":smileywink: -seagate knows about this problem -such drives are still selling all-around-the-world So' i have some questions: 1)can it be fixed at home (by myself) - wia firmware update or something else 2)can i restore some data 3)as the drive was purchased in China and i live in Belarus - can i hope for some kind of warranty? ps Sorry for posting this message in the forum - i cant create a question case at seagate's site - it writes that there is a "missed xml" or smth like this. END So the URL for this thread is here: http://forums.seagate.com/stx/board/messag...;thread.id=3283 A member called Fatlip was making extremely good progress on the problem and had almost solved it when it was shut down. Hardly anyone on the thread had yet heard back from Seagate about the problem including myself. So I would like this thread to continue on from the other one as here we won't have moderators editing and deleting posts. 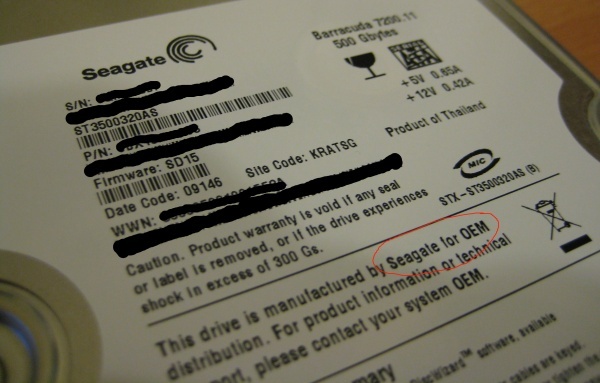 Read the Seagate thread in full (yes I know its 19 pages) and you will get what I mean. Hopefully someone here can get help somehow for the large amount of people affected by this terrible firmware problem.